Crisis-trained Billy Graham Rapid Response Team (RRT) chaplains deployed to Toronto to offer emotional and spiritual support to shocked and heartbroken residents after a shooting rampage left three people dead, including the shooter, and 13 injured in a busy tourist and restaurant district in Canada’s largest city. A total of 16 people were shot during the attack at about 10 p.m. Sunday, July 22 along Danforth Avenue in Toronto’s Greektown neighborhood. During the week-long deployment to Toronto, chaplains offered a ministry of presence and prayer to a grieving community. In total, they prayed with 138 people, leading to seven salvations. One of the Billy Graham RRT chaplains ministers to a Danforth resident in Toronto. “We were there to pray for the people of Toronto and provide Christ’s compassion, care, and love to hurting residents, restaurant employees, and emergency responders,” said Merle Doherty, manager of the Billy Graham Evangelistic Association of Canada’s RRT chaplains. Throughout the week, chaplains spent time at the memorial site on Danforth Avenue, where they prayed over the city and offered a listening ear for those mourning the loss of the two shooting victims: an 18-year-old woman and a 10-year-old girl. On Monday night at Calvary Church in Greektown, chaplains attended a vigil and prayer walk. At the vigil, a crowd of nearly 600 people heard a message of hope in Jesus Christ that was shared by the local pastor. Chaplains spent most of the evening ministering to the young adults in the church who were especially heartbroken by the tragic death of the 18-year-old woman, who was a young adult from the local community. Another pray vigil took place later in the week, which was attended by over 2,500 people. Afterwards, chaplains were able to share the Gospel with seven people using the Steps to Peace With God booklet. Some people were open to hearing about Jesus, while others just needed a hug and a listening ear. Some were already believers who needed reassurance, while others were lost and desperate for hope in Christ. 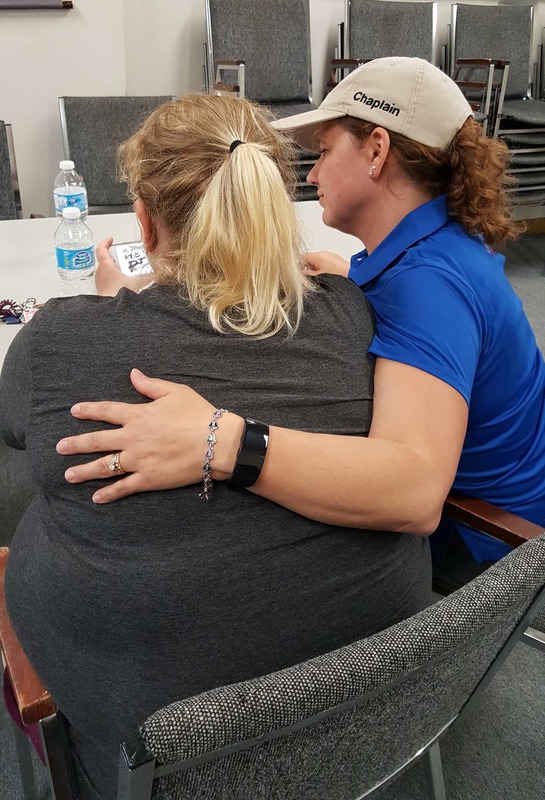 Whatever their circumstance, the chaplains were blessed with opportunities to meet each person where they were at and find small ways to show God’s love to them during this time of tragedy. This was the second time chaplains were sent to Toronto this year. Chaplains spent a week ministering in the city in April after a high-speed van attack along Yonge Street killed 10 people and injured 16. During 2018, chaplains also offered a listening ear, a shoulder to cry on and, when appropriate, prayers to people in Humboldt, SK, after a bus accident killed 16 people, and to flood victims in New Brunswick and British Columbia. 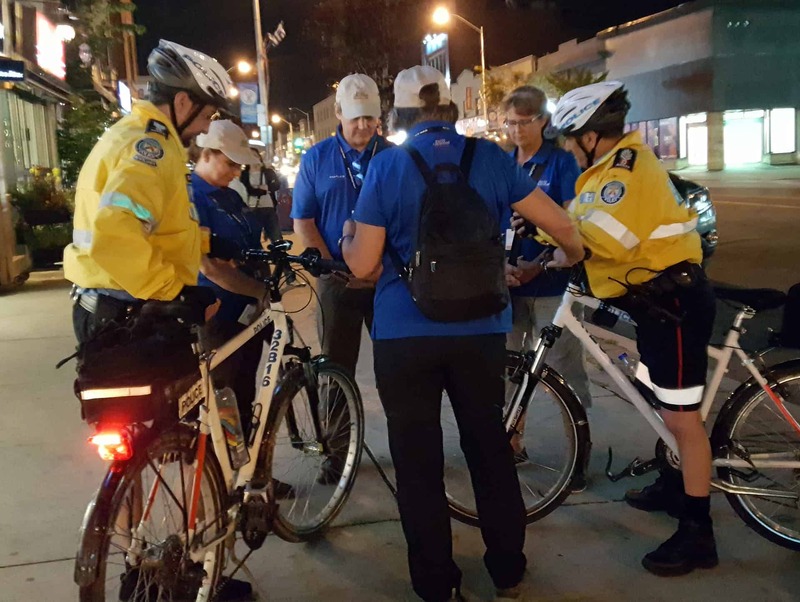 RRT chaplains pray with police officers on Danforth Avenue.